Hogwarts in the snow is the latest theme to be running at Warner Bros Studio Tour in London, and we were fortunate enough to go 2 days before Christmas and it truly was a magical affair. As you can see from the title image this event is running from 13th November 2015 until 31st January 2016 - so there is still time to get tickets, which range from £27/£35 for a child/adult (respectively) or £107 for a family of 4 and children under 5 go free. In my opinion, what you get out of the tour is far greater than the cost to get in. We are HUGE Harry Potter fans so when we saw the set which is situated just off the M25, I got goosebumps and if you have one, you may also have a very excitable 4-year-old "oohing" at the Wizard Chess pieces and images on the outside of the building (I think I may have topped Max on the excitement scale that day)! 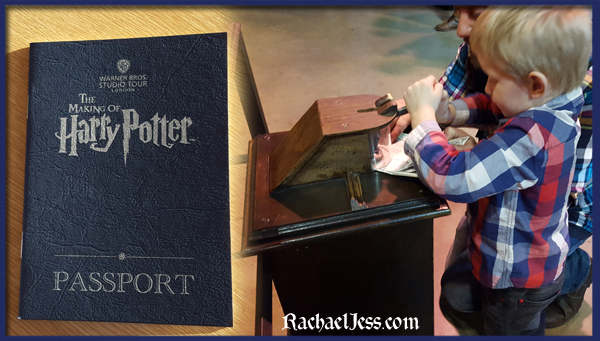 We picked up our tickets and Max was given a Passport which had little tasks to complete along the way such as finding the 13 Golden Snitches hidden throughout the studios and getting the passport stamped at various checkpoints. Because of the time of year, the entrance is decorated with the most magnificent Christmas tree - decorated with snow of course and you'll be pleased to know that this is just one of many things to be looking at whilst you wait in line to enter the tour. We found the queue whilst busy, moved very quickly. In this section you are shown everything to do with the film from Make Up, Special Effects of Quidditch, mastering how to use a wand, the dormitory, the entrance to Dumbledore's office..... the list goes on and on. I almost forgot I was there with family! You get so wrapped up in the world of Harry Potter you can almost hear Ron wishing Harry a Merry Christmas and the demented laugh of Bellatrix Lestrange. 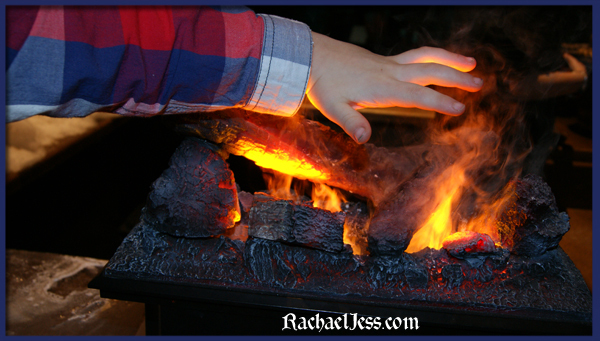 But then, in the middle of the studio, there is a demonstration on how to make snow and fire! This you may find your young ones fascinated with. I actually struggled to get Max away from this section and at one point left him there with his daddy whilst I went to the 'darker' parts of the tour. You are free to roam around at your leisure here, in fact, after the Great Hall visit you can take the tour at your leisure, it is still a 'one way' system so once you've been and had some Butterbeer you can't then come back into J, you carry on to studio K.
But I'm jumping ahead. There is a lot to see and do in Studio J alone. 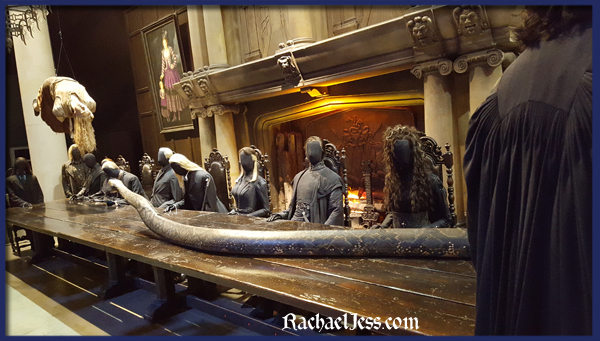 We went in the morning and after we had seen the green screens of how to fly a car and a broom and visited the magnificent Hogwarts Express we were ready for some Butterbeer and lunch at the backlot cafe. We took some lunch with us, but there are plenty of refreshments to be had. We sat and ate whilst we watched the snow machine come on randomly and fill up Privet Drive and the Potter House with snow. In the courtyard is also the Hogwart's Bridge and the fabulous night bus so again, whilst we rested (well I did, Max ran in snow every time it came on), we had so much to look at and marvel over. We even got to have a go on Hagrid's bike and the infamous Weasley car. 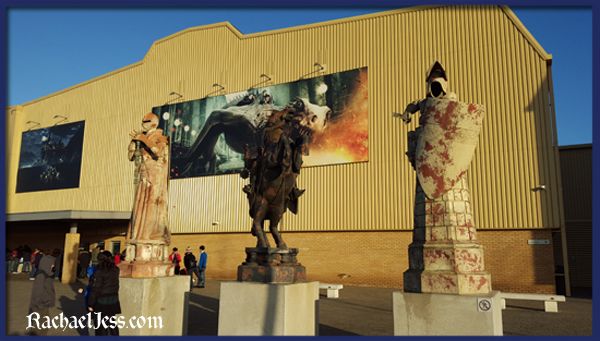 We ventured on to Studio K which has special effects, life-size models of the casts and their original clothing, with beasts and animatronics leading us to Diagon Alley (no Floo powder needed), this, as you would expect, is amazing, and there is also a talk on how the footprints in the snow were made. We then ventured on through to the architecture and then on to the magnificent piece of all Hogwarts...... In the Snow. By far my favourite part of the tour. As you go round the lights dim and Hogwarts lights up and by the time you reach the bottom all 8 movies have played out in your head at various stages, for any Harry Potter fan this stage - is truly breathtaking. We finished the tour inside Ollivander's wand shop and true to any event come out into the gift shop which is massive and I could have lived there! We were there 4 hours, but for me, it was too short I could have stayed longer, I could have stayed and read every single sign, every single poster and infographics on what I was looking at. I could have taken a photo of every single item my eyes saw and still want more. As it was, I had a very very well behaved excited 4-year-old, who has only seen The Philosopher's Stone and The Chamber of Secrets, but still knew of Hedwig, Aragog and Privet Drive. I would wholeheartedly recommend this trip to any Harry Potter fan, old or new, young or old. But one thing I would say - take a camera. I know that sounds obvious, but if you're planning on using your smartphone - take a portable charger. I took my heavy duty charger as my Galaxy S6 went down to 45% whilst we were still in Studio J. As much as I want to share with you every single photo and video that I took that day, I also don't want to ruin it for you, so I'm hoping the snippets I have shown is enough to make you get excited about going and seeing it all for yourself. - Take a camera, or a portable charger for your phone or preferably both. - Take some snacks, and money to buy yourself a wand and other magical goodies. If you're thinking of going then please do come back and let me know what you thought of it, and any further advice you would give others? 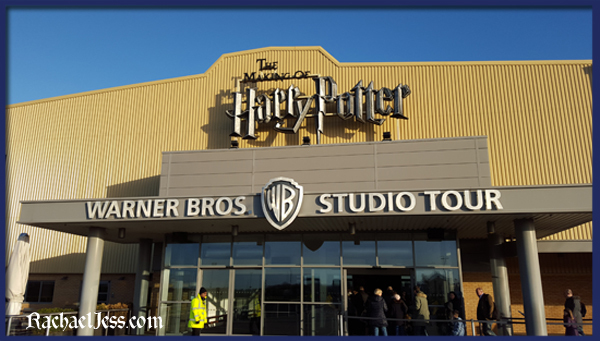 Disclaimer: I received tickets from WB Harry Potter Studio to review the tour. The above wording is all my own and not influenced over the visit received.